According to Eve-Kill.net, Heavy was podded in Jita at least 56 times in a row. 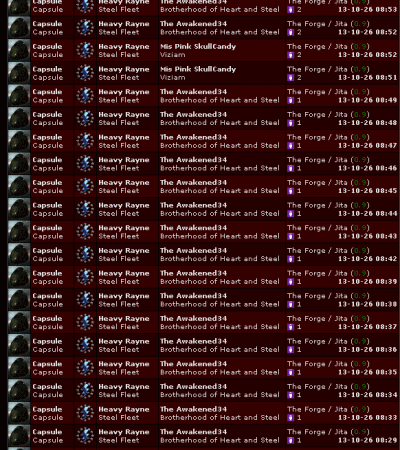 Only kills made by those with their API's on file with Eve-Kill.net appear, so suddenly the 81 pod claim was credible. Impressive. But then I was contacted by Erotica 1, and I learned that there was much more to this tale than met the eye. Let's start from the beginning. Heavy Rayne > hello ? Erotica 1 > Heavy Rayne congratulations! It was a day like any other. Heavy had sent Erotica a nice chunk of isk for doubling, and he earned a free ticket to the bonus room. Erotica 1 > do you know how to do that? Everyone knows that in order to win in the bonus room, one must show complete faith in Erotica 1. Fortunately, Heavy Rayne seemed like a faithful kind of fellow. Over the course of the next few hours, he systematically transferred all of his assets to Erotica 1 and sang a song. Then the podding began. The Awakened34 > I had barely enough ammo. The Awakened34 > That was impressive. Heavy Rayne broke the record of poddings. Since he didn't update his clone between deaths, he lost skillpoints each time. Many years ago, EVE was even more unforgiving: A single death in a non-upgraded clone could result in the loss of nearly all skillpoints. Today, you only lose some of your skillpoints, starting with the loss of your most skillpoint-intensive skills. 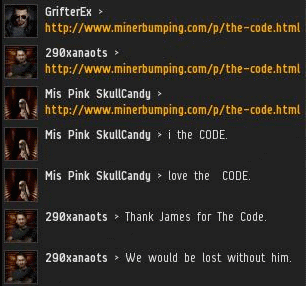 In response to Heavy Rayne's 81 pod losses, everyone in the bonus room gave glory to the Code. They knew none of this would have been possible without it. Not a day goes by that highsec isn't blessed by the Code. Heavy Rayne's time in the bonus room didn't end so happily, though. He admitted that he was going to transfer isk from a character named Kiarrah, on his brother's account. Account sharing is against the EULA, so Heavy lost out on his chance to win. But the story doesn't end there. No, that's where the story begins. And since Heavy gave his full API to Erotica 1, we can read the EVEmails that help tell the rest of the story. Just a FYI all, I was contacted by Heavy Rayne / Kiarrah thismorning. He stated to me he fell for some kind of Goon scam? where he had to POD himself 50 times and give away all his assets? well after he told me this and I started thinking about it I looked at the KB and all 50 of his POD losses are on there. At this point I am NOT sure what to think. As an emergency immediate precaution I have removed BOTH Kiarrah and Heavy Rayne from the Corp pending an Investigation. I also started a new Corp Vote for new CEO of Steelfleet.. Thank you for your time. Heavy Rayne and his brother--or is it his alt?--belonged to the same corp. Cryptic Powers, the CEO of the corp, were alarmed to see that his corp's killboard was "ruined" by the pod deaths. Heavy and his brother and/or alt were immediately expelled and an "investigation" began. Since the ruination of the killboard occurred on his watch, Cryptic stepped down as CEO. I was wodeering if we could talk so i can get a better idea of what happened. I consider you an asset to this corp and want you here, but this type of stuff can't be happening especially with the timming of us trying to get in an alliance. WOuld it be possible to schedual a meeting when you have time? when can you meet on ts? The new CEO agreed that the corp's number one priority was the preservation of good killboard stats. Otherwise, how could they get into an alliance? In the meantime, Cryptic Powers would do the gumshoe'ing himself, even though he was stepping down as CEO. Cryptic was a man who liked to clean up his own messes. Where to start? Erotica 1's bonus room. Cryptic wasted no time in beginning the investigation. He ran into Erotica 1, who is your classic femme fatale. Fortunately, however, she was in a helpful mood. Cryptic Powers > how did he loose? The story was simple. Now that Cryptic had it, it was only a question of what he would do with the information. Would he sanction Heavy Rayne for his EULA violation, or would he pop off at Erotica 1 and put all the blame on the New Order? Erotica 1 > popcorn in microwave"
Ero with the timely brb. like a boss. OK but what happened to the care-bear POS from last week? I predict rage the like of which even God hasn't seen.....or at least not since last week. I want so badly to give a hint... But I won't. I can't wait to see James narrate the rest. Can you at least tell us what kind of popcorn it was? Was it ready when you got to the microwave? Did the bag kind of explode from overcooking? Did you burn your fingers with all of the steam coming out of it? Did you eat it out of the bag or put it in a bowl? Was it overly salty? We have millions (literally like maybe 10 more) questions. Holy Crap he kept killing himself after he was booted! This is legendary .... wait is his other brother's toon "The Whis". This guy is legendary, even losing his skillpoints! The fact that he is still playing EvE is amazing. "Heavy Rayne and his brother--or is it his alt?" For what it's worth, I can confirm Heavy does have a brother. They both sound like extras from Deliverance. They were terminated from my old corp (http://kb.hardknocksinc.net/index.php/kill_related/2669/) for repeated displays of rampant stupidity the likes of which I haven't seen before or since, an example of which was getting a corp mates t3 blown up because one of them was scouting a gate with the overview minimized 'So he could see better'. These are not the brightest of individuals. I can confirm that heavy does indeed have a brother. His brother Kiarah is a total tool and was in a wh corp with me at one time. Heavy also applied right as we were kicking kiarah for being a thief. I've bee in in mumble with them both at the same time, so i can confirm that it isn't an alt. But both are incredibly annoying.